Download "13 Space Photos To Remind You The Universe Is Incredible"
1 13 Space Photos To Remind You The Universe Is Incredible NASA / Via photojournal.jpl.nasa.gov New ultraviolet images from NASA s Galaxy Evolution Explorer shows a speeding star that is leaving an enormous trail of seeds for new solar systems. The star, named Mira (pronounced my-rah) after the latin word for wonderful, is shedding material that will be recycled into new stars, planets and possibly even life as it hurls through our galaxy. 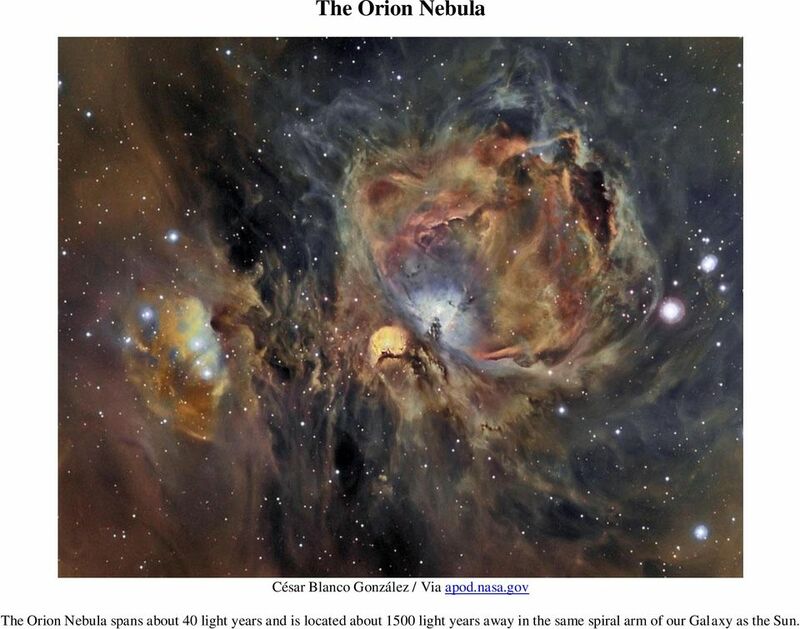 2 The Orion Nebula César Blanco González / Via apod.nasa.gov The Orion Nebula spans about 40 light years and is located about 1500 light years away in the same spiral arm of our Galaxy as the Sun. 3 A swirl of star formations Credit: ESA/Hubble & NASA, M. Hayes / Via nasa.gov This is a starburst galaxy a name given to galaxies that show unusually high rates of star formation. 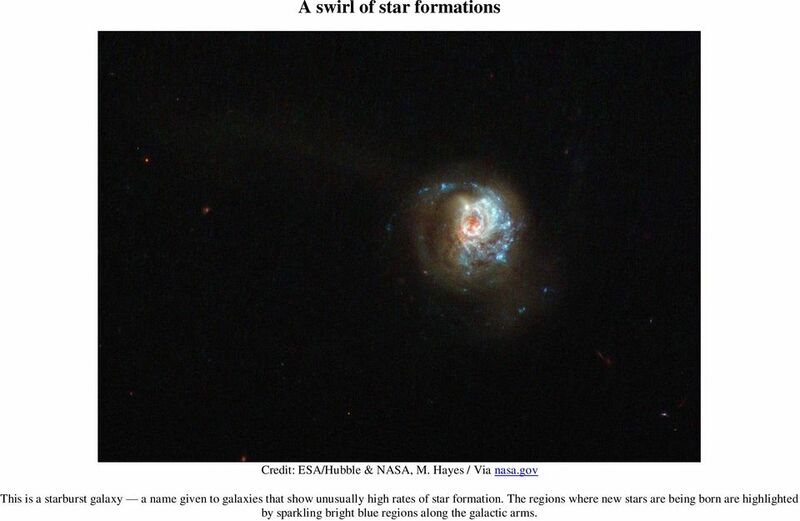 The regions where new stars are being born are highlighted by sparkling bright blue regions along the galactic arms. 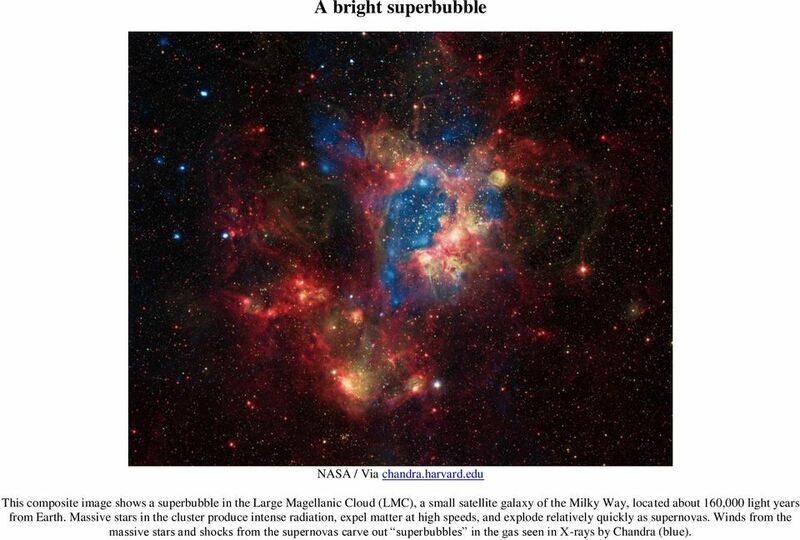 4 A bright superbubble NASA / Via chandra.harvard.edu This composite image shows a superbubble in the Large Magellanic Cloud (LMC), a small satellite galaxy of the Milky Way, located about 160,000 light years from Earth. Massive stars in the cluster produce intense radiation, expel matter at high speeds, and explode relatively quickly as supernovas. Winds from the massive stars and shocks from the supernovas carve out superbubbles in the gas seen in X-rays by Chandra (blue). 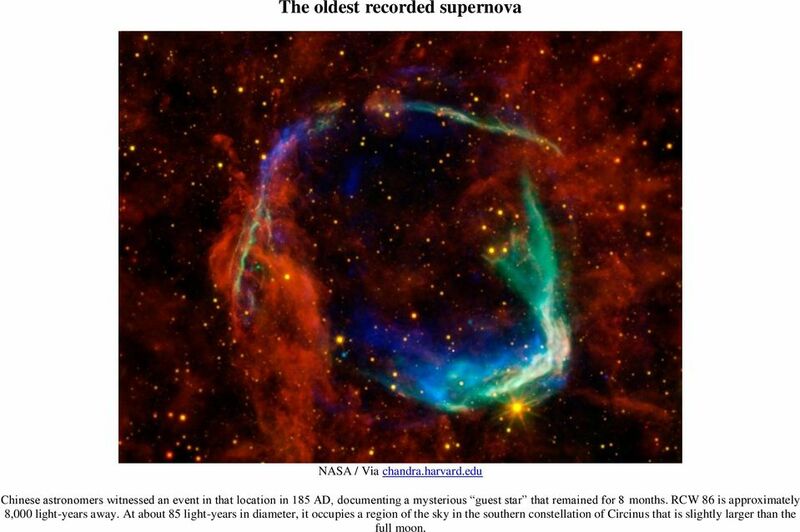 5 The oldest recorded supernova NASA / Via chandra.harvard.edu Chinese astronomers witnessed an event in that location in 185 AD, documenting a mysterious guest star that remained for 8 months. RCW 86 is approximately 8,000 light-years away. At about 85 light-years in diameter, it occupies a region of the sky in the southern constellation of Circinus that is slightly larger than the full moon. 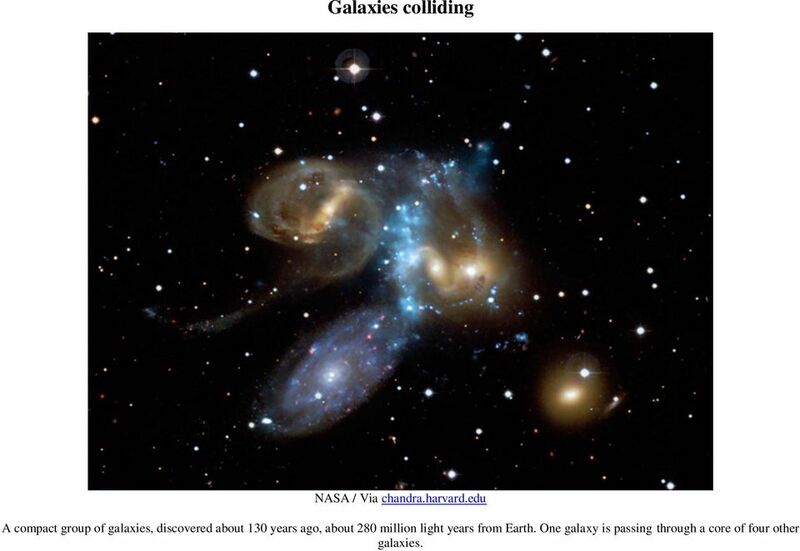 6 Galaxies colliding NASA / Via chandra.harvard.edu A compact group of galaxies, discovered about 130 years ago, about 280 million light years from Earth. One galaxy is passing through a core of four other galaxies. 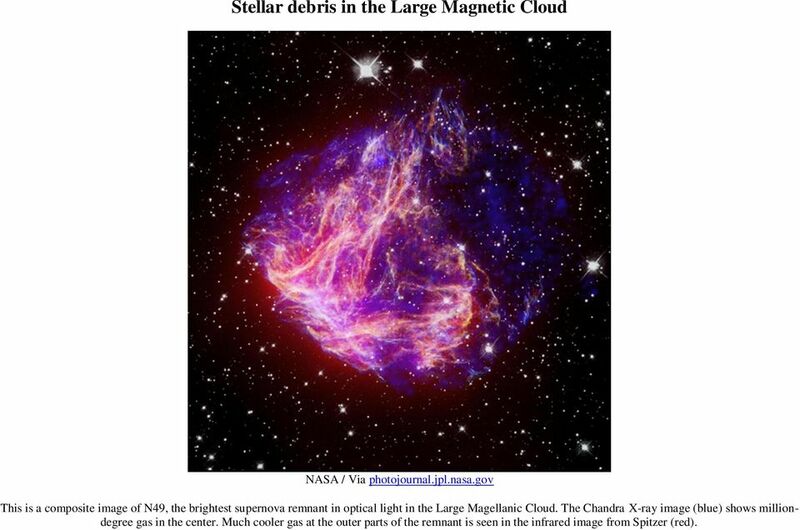 7 Stellar debris in the Large Magnetic Cloud NASA / Via photojournal.jpl.nasa.gov This is a composite image of N49, the brightest supernova remnant in optical light in the Large Magellanic Cloud. The Chandra X-ray image (blue) shows milliondegree gas in the center. Much cooler gas at the outer parts of the remnant is seen in the infrared image from Spitzer (red). 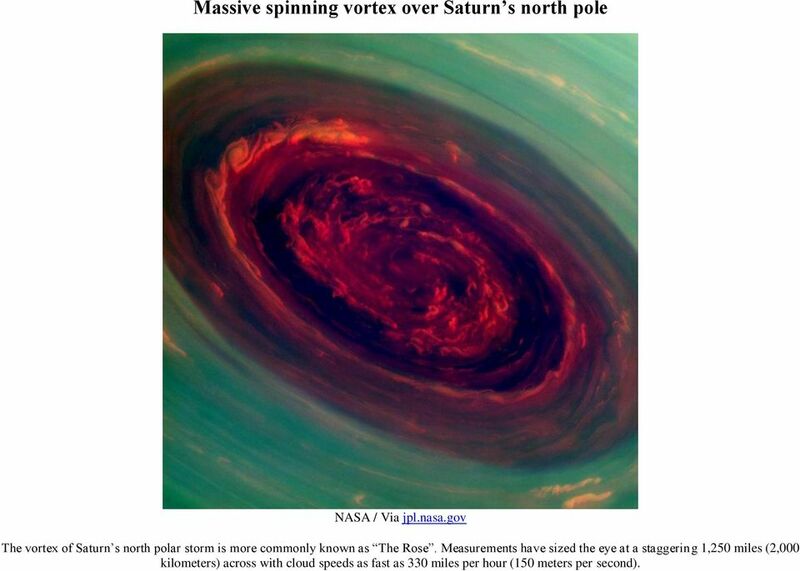 8 Massive spinning vortex over Saturn s north pole NASA / Via jpl.nasa.gov The vortex of Saturn s north polar storm is more commonly known as The Rose. Measurements have sized the eye at a staggering 1,250 miles (2,000 kilometers) across with cloud speeds as fast as 330 miles per hour (150 meters per second). 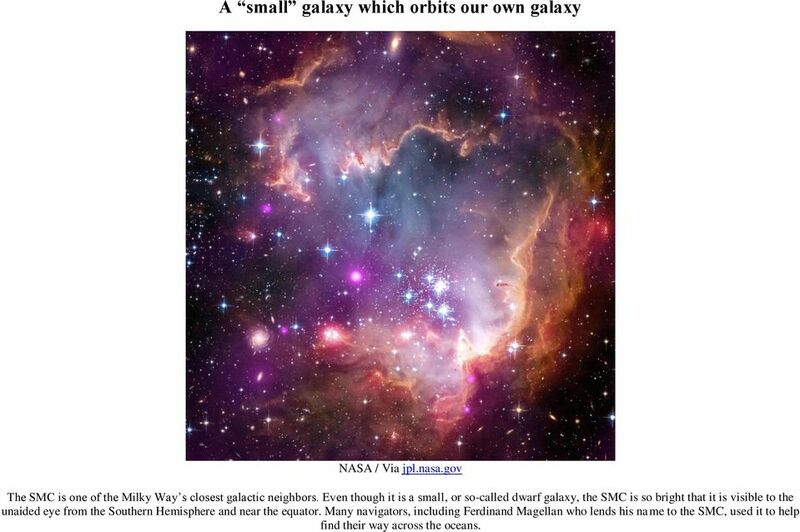 9 A small galaxy which orbits our own galaxy NASA / Via jpl.nasa.gov The SMC is one of the Milky Way s closest galactic neighbors. Even though it is a small, or so-called dwarf galaxy, the SMC is so bright that it is visible to the unaided eye from the Southern Hemisphere and near the equator. Many navigators, including Ferdinand Magellan who lends his name to the SMC, used it to help find their way across the oceans. 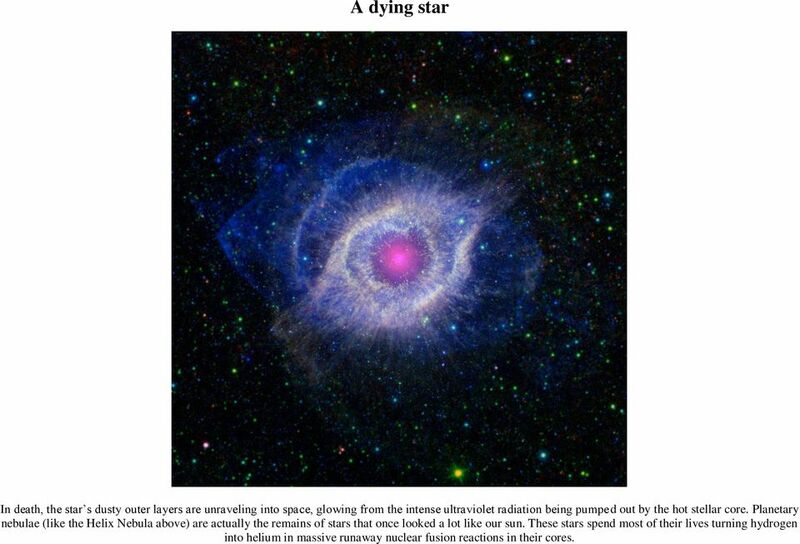 10 A dying star In death, the star s dusty outer layers are unraveling into space, glowing from the intense ultraviolet radiation being pumped out by the hot stellar core. Planetary nebulae (like the Helix Nebula above) are actually the remains of stars that once looked a lot like our sun. These stars spend most of their lives turning hydrogen into helium in massive runaway nuclear fusion reactions in their cores. 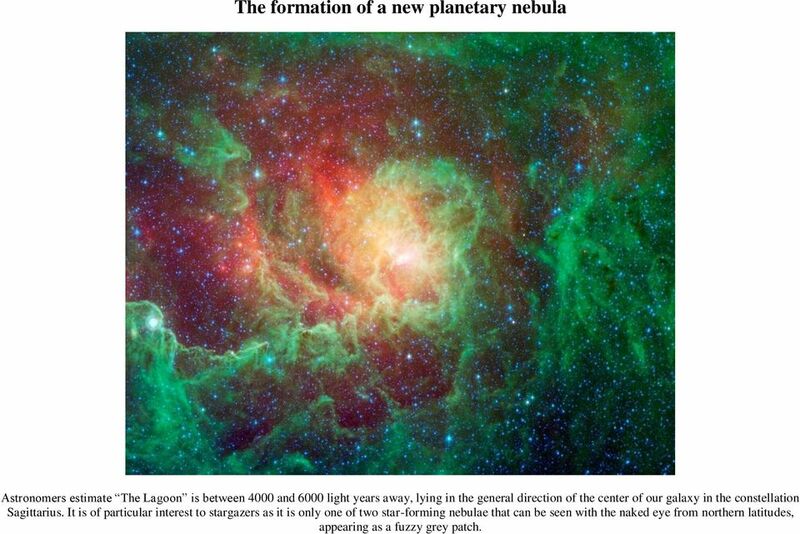 11 The formation of a new planetary nebula Astronomers estimate The Lagoon is between 4000 and 6000 light years away, lying in the general direction of the center of our galaxy in the constellation Sagittarius. It is of particular interest to stargazers as it is only one of two star-forming nebulae that can be seen with the naked eye from northern latitudes, appearing as a fuzzy grey patch. 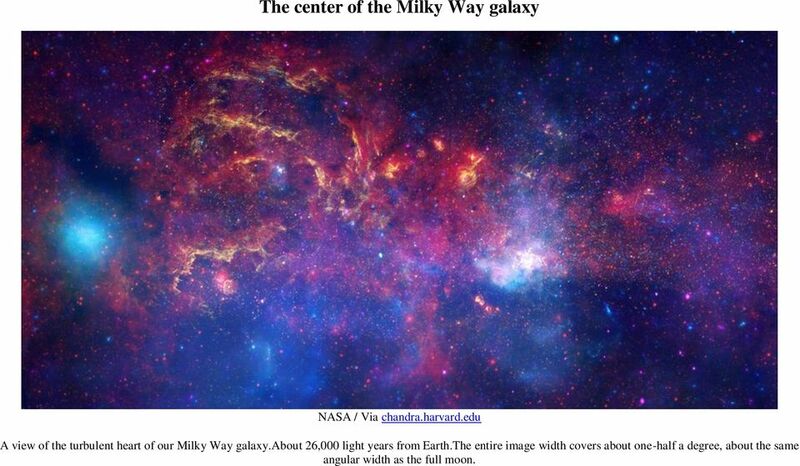 12 The center of the Milky Way galaxy NASA / Via chandra.harvard.edu A view of the turbulent heart of our Milky Way galaxy.about 26,000 light years from Earth.The entire image width covers about one-half a degree, about the same angular width as the full moon. 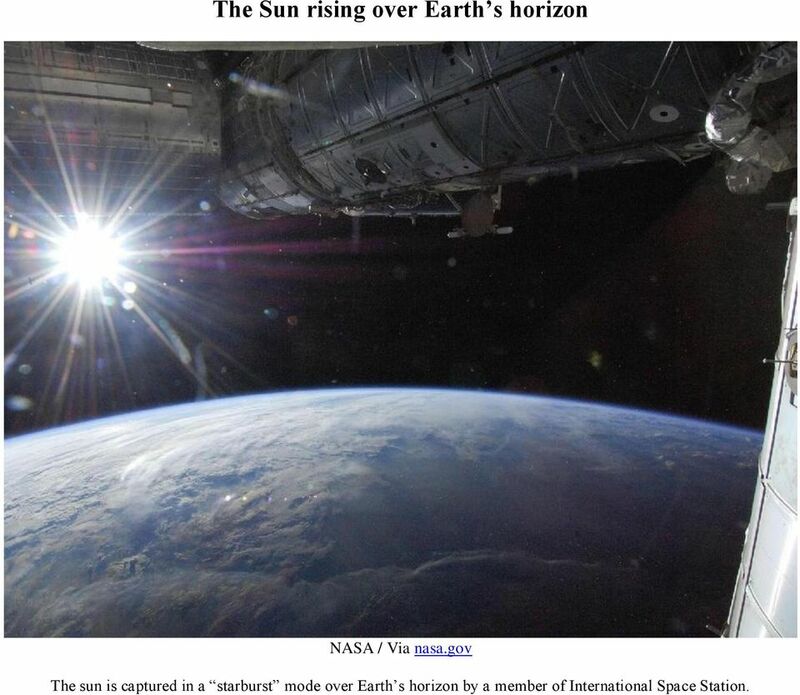 13 The Sun rising over Earth s horizon NASA / Via nasa.gov The sun is captured in a starburst mode over Earth s horizon by a member of International Space Station. Grade 6 Standard 4 Unit Test Astronomy. 2. Which of the following correctly ranks astronomical objects by size, starting with the smallest? How Deep Into Space Can the Harken Observatory Telescope See? National Aeronautics and Space Administration Supernova Remnant SN 1006 Taken from: Hubble 2008: Science Year in Review Produced by NASA Goddard Space Flight Center and the Space Telescope Science Institute. You may want to offer a small prize for students who answer questions correctly, or teams who win the game. Image taken by NASA Asteroids About 6,000 asteroids have been discovered; several hundred more are found each year. There are likely hundreds of thousands more that are too small to be seen from Earth. So What All Is Out There, Anyway? A blue flame is hotter than a yellow one. astronomy 2008 1. A planet was viewed from Earth for several hours. The diagrams below represent the appearance of the planet at four different times. LER 2891. Ages. Grades. Solar System. A fun game of thinking & linking! Teacher s Guide Grade Level: 6 12 Curriculum Focus: Astronomy/Space Duration: 7 segments; 66 minutes Program Description This library of videos contains seven segments on celestial bodies and related science. Student activities Activity 5: Make your own planisphere Background information Star observations With the naked eye, we are able to see about 3000 stars on a clear night (with minimum light pollution).